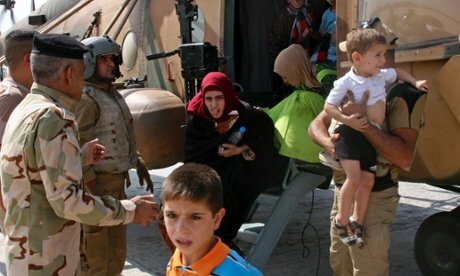 Humanitarian aid drops have been made by the US planes to the besieged Iraqi town of Amirli, the Pentagon has said. Some 15,000 minority Shia Turkmen in Amerli have been surrounded by Islamic State (ISIS) militants for two months. The US also carried out air strikes on ISIS positions. The Iraqi army, Shia militias and Kurdish fighters have been struggling to break the siege. Aircraft from the UK, Australia, France joined the US in the humanitarian aid drops, said Rear Admiral John Kirby. Food, water, and medical supplies were delivered. Rear Adm Kirby said operations would limited in scope and duration, as required to protect civilians trapped in Amirli. The UN has expressed fears there could be a massacre if IS breaks through defenses in the town, which lies in Kurdish-controlled Iraq. Earlier, the US launched new air strikes on IS near the key Mosul Dam. In a statement, the US military said an armed vehicle, a fighting position and weapons were destroyed in the raid. It said the strikes were in support of operations conducted by the Iraqi security forces near the strategic dam in the north of the country. ISIS has been accused of atrocities in areas of Iraq and Syria under its control. The Shia Turkmen are seen as apostates by the ISIS militants. From the south, Iraqi government troops and allied Shia militias are trying to push into the Marin hill, which overlook the plain on which Amirli lies. With the help of air strikes by the Iraqi air force, they are reported to be making slow progress, with roads in the area heavily mined and booby-trapped by the Islamist militants. From further north, a combination of army forces, Shia militia and Kurdish Peshmerga fighters is reported to be trying to push down towards Amerli through a string of villages held by ISIS. In one village, Salam, local sources said Shia militias had taken control of half of the settlement – but the ISIS militants fought back and drove them out. The impression at this stage is that rapid movement to break the siege is unlikely and that it may be a protracted affair. The operation is reported to have two objectives: to break the siege of Amirli and to reopen the main highway leading north from Baghdad. The road is currently blocked by ISIS. Meanwhile, reports from Syria say that hundreds of Yazidi women, another Iraqi minority, have been sold and distributed as wives among militant fighters in Syria. The women who were abducted during recent attacks by IS in Iraq are said to have been transported to Syria after being forced to convert to Islam. At least 27 of them were sold to ISIS members for marriage, according to the UK-based monitoring group the Syrian Observatory for Human Right.